This model runs to reproduce published results in COR, OpenCell and PCEnv. The units are consistent throughout. This model currently reproduces Figure 2B, changing KH (to infinity) and f2 (to 1) will allow the model to reproduce Figure 2A. The initial conditions were estimated and the model run to steady state to yield precise values, changing any parameters will necessitate repeating this procedure. Reaction scheme of the model. 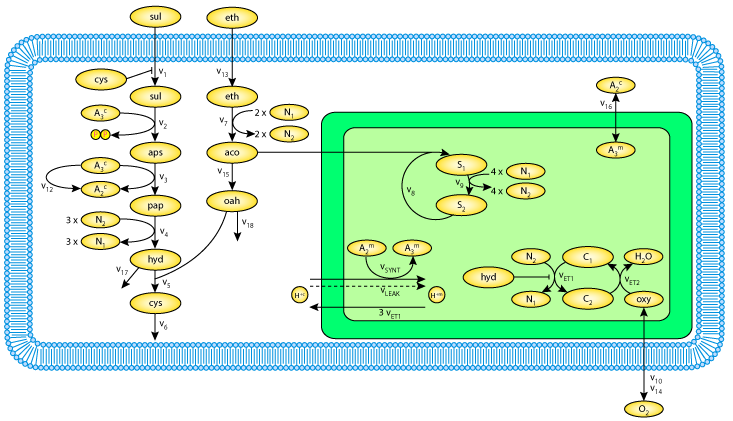 The following abbreviations are introduced for the metabolites: sul: sulphate ions, aps: adenylyl sulfate, pap: 3-phosphoadenylyl sulfate, hyd: hydrogen sulphide, cys: cysteine, eth: ethanol, aco: acetyl-CoA, S1 and S2: intermediates of the citric acid cycle, oxy: oxygen, C1 and C2: protein complexes involved in oxidative phosphorylation, A3: ATP, A2: ADP, N1: NAD(P)+, N2: NAD(P)H, oah: O-acetylhomoserine. The cytosolic and mitochondrial compartments are characterized by the superscripts c and m, respectively. Derived from workspace Wolf, Sohn, Heinrich, Kuriyama, 2001 at changeset 3a6924b88a89.